Herring Gull R77 in flight only a couple of weeks after first fledging. Gulls of the Americas is only one of many sources, both in print and online, that attempt to illustrate and describe gull plumage cycles. So why this photo-essay? Simple. Neither Gulls of the Americas nor any other printed reference that I know of uses photographs of banded gulls -- and in particular, birds that were banded as chicks. One other website does, the Gull Research Organization's complex of pages on Larus argentatus smithsonianus, aka the American Herring Gull. About half their photos show banded birds. The advantage of using such birds is that we know, without a doubt, when the bird was banded and therefore how old it is. 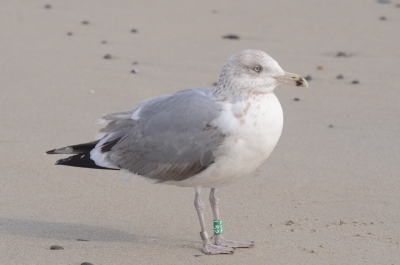 The Appledore Gull Banding Project on Appledore Island in the Isles of Shoals has banded hundreds of gulls over the last ten years. Since I started noticing and photographing banded gulls a couple of years ago, I've taken dozens of photos of Appledore-banded gulls, including many young ones at different ages. (For some reason, almost all of these have been Herring Gulls; I have only a few pictures of Appledore Great Black-backed Gulls.) As a result, my photos of Appledore Project gulls provide a chance to survey immature Herring Gulls and their plumages, all with gulls of known age. Herring Gull L52, as it appeared late in its 3rd year of life. What follows is my attempt to put this fact to use, using photos from my personal collection. This is NOT intended to be a thorough or complete study. Individual Herring Gulls vary greatly in their rate of maturation and in the timing and speed of their molt cycles. Rather, this is simply one journeyman birder's attempt to illustrate Herring Gull plumages using birds of known ages. 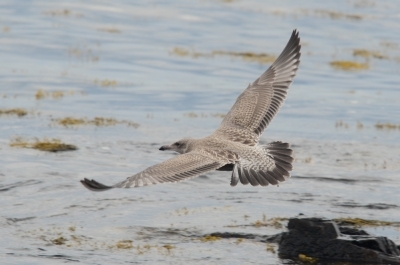 Hopefully this photo-essay will help other birders learn how to tell an immature gull's age. Use the gull-head icons at the top of each page to move forward (right-facing icon) and back (left-facing icon). All photographs and text used in this photo-essay are ©2015 Jonathon Woolf. Any comments/thoughts/suggestions may be emailed to me at email goes here. Please feel free to link to this photo-essay. I recommend all such links be to the intro page.